Once again I have seen another Christian leader try to claim that physical “discipline” (I hate when people try to call corporal punishment “physical discipline” as hitting a child is NOT “discipline,” it is punishment!) is a part of the “rod” verses of Proverbs. They just do not understand that the Hebrew meaning of the “rod” verses do not include the use of corporal punishment with children. If they did, God would have provided more instructions on how, when, why, and at what age children should be spanked/hit. “The child may be more strong-willed than the parent, and they both know it. If he can outlast a temporary onslaught, he has won a major battle, eliminating punishment in the parent’s repertoire. Even though Mom spanks him, he wins the battle by defying her again. The solution to this situation is obvious: outlast him; win, even if it takes a repeated measure” (Dobson, 1970, p. 45). “For example, a dime sized bruise on the buttocks of a fair-skinned child may or may not indicate an abusive situation. It all depends. In an otherwise secure and loving home, that bruise may have no greater psychological impact than a skinned knee or a stubbed toe. Again the issue in not the small abrasion; it is the meaning behind it” (Dobson, 1996, p. 25). “After you have spanked, take the child up on your lap and hug him, telling him how much you love him, how much it grieves you to spank him, and how you hope that it will not be necessary again. Then if he is still not restored, you are to check your own spirit to see if you have handled him roughly… [or] brought unholy anger on this holy mission, and if you have, seek forgiveness from God. If your child is still angry, it’s time for another round, ‘Daddy has spanked you, but you are not sweet enough yet. We are going to have to go back upstairs for another spanking'” (Tripp, 1995, p. 149). “On the bare legs or bottom, switch him eight or ten licks; then, while waiting for the pain to subside, speak calm words of rebuke. If the crying turns to a true, wounded, submissive whimper, you have conquered; he has submitted his will. If the crying is still defiant, protesting and other than a response to pain, spank him again” (Pearl, 1994, p. 80). It is very scary to me that they say different things, but yet, advocate harsh, “loving” spankings. Also, dark skinned children must suffer much more pain than a lighter skinned child as bruises don’t show up as quickly on dark skin. 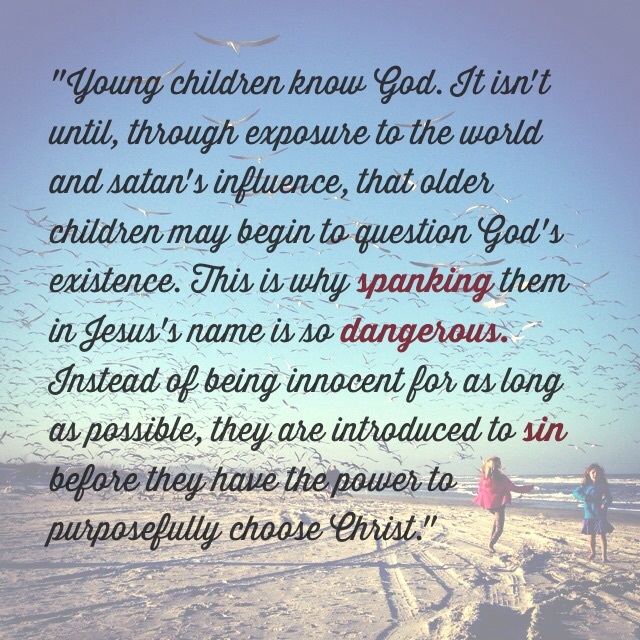 But since there is yet another “Christian” leader teaching parents to spank/hit their children in order to “Bibically discipline” them, I will explore the topic once again. I cover all of this in my book, Gentle Firmness. We know that the Hebrew meaning for “rod” is Shebet and that the rod was a large stick with spikes on the end of it. The shepherds never used it to hit the sheep. Shebet is also used in the Bible as a symbol of authority. The problem most Christians have with this verse as well as the other “rod” verses that seem to advocate using corporal punishment with children is that the Hebrew word for “discipline” which is Muwcar includes “chastisement” in the definition. What confuses most pro-spanking Christians is that the English definition for chastisement includes physical punishment. However, it means verbal correction as well. When looking at the dictionary, there are many synonyms for chastise. Let’s look at some of them: “Rebuke, Lecture, Scold, Reprimand, Bawl Out, Dress Down, and Lecture.” Yes, it can mean physical punishment, but it also means many other things! Given the Biblical context in which chastise is being used here in Proverbs, we are walking on very shaky ground if we choose to interpret it as a command to spank our children. God rebukes us all the time. No, it’s not pleasant, but it’s not in a harsh tone and He immediately forgives us when we repent. And yes, if we choose to do our own thing against His will, He will allow, not inflict, pain into our lives. It’s called natural consequences. Another issue with insisting on punishing and spanking/hitting our children and using the Bible to justify it is that Jesus suffered and died for ALL of our sins! How come adults can just pray for forgiveness and they are forgiven? But our children who are just learning don’t get grace and forgiveness until they “pay” for their “sins.” How is this Biblical or Christ-like? Finally, sadly, some Christians do follow this verse to a “t” and spank their children for being children. Yet, when we really study this and other verses that seem to advocate corporal punishment with children, we see that there is no reference to spanking/hitting children. It is also important to understand child development as God created children to think and behave the way that they do. To constantly hit them for being “unwise” by adult standards is neither Biblical nor fair. And you can’t beat foolishness out of children any more than you can beat the devil out of them. Jesus has raised children’s status and has called us to be like little children in order to enter the kingdom of heaven. In fact, Jesus had plenty of time to teach about children and NEVER said anything about spanking/hitting them! We are to drive out folly by teaching, guiding, protecting, and comforting our children. To do anything other than that, especially to take the above verse literally, would be to teach children that no matter what they do, they will never be able to measure up. Does this sound like the way to raise children up in the Lord? Dobson, J. (1970). Dare to Discipline. Carol Stream, IL: Tyndale House Publishers. Dobson, J. (1996). The New Dare to Discipline. Carol Stream, IL: Tyndale House Publishers. Pearl, M. (1994). To Train Up A Child. Pleasantville, TN: No Greater Joy Ministries. Tripp, T. (1995). Shepherding a Child’s Heart. Wapwallopen, PA: Shepherd Press. Training Children To Love Jesus? I was surprised to discover that some Christians believe that they can “train” their children to love Jesus. Frankly, I find this a bit disturbing because how can one “train” children? They’re not animals. And when Christians say train, it usually means a great deal of corporal punishment is being used as in the Michael Pearl style. I don’t want to get to involved in what the Hebrew meaning of “train” is for this post as I believe the Christians claiming that they must “train” their children are using “train” wrongly anyway. Can you truly train anyone, let alone children, to love? Does God train us to love Him? According to the Bible, we are not trained by God to love Him. 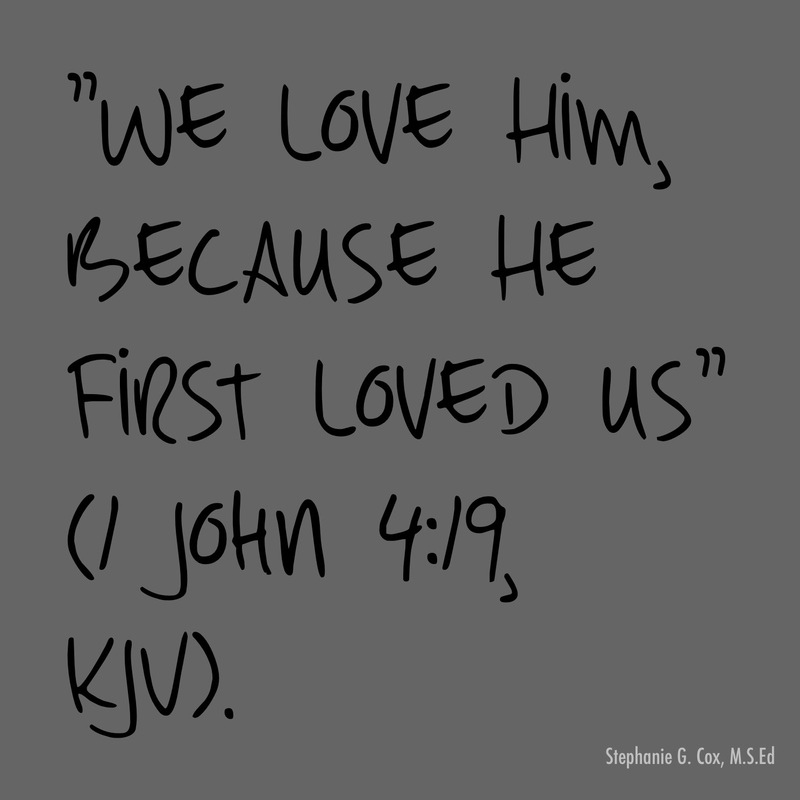 “We love Him, because He first loved us” (1 John 4:19, KJV). And how did He show us love? ”But God demonstrates His own love toward us, in that while we were yet sinners, Christ died for us” (Romans 5:8, NASB). No, God never “trains” us to love Him because that would pretty much be forcing us to love Him. God prefers true love that can only come from deep within our hearts because we have seen and felt God’s love for us. He is gentle and patient while He waits for us to accept His great love for us and reciprocate it back to Him! Another thing, young children have a special knowledge of Who God is. They already love Him. “At that time Jesus said, ‘I praise You, Father, Lord of heaven and earth, that You have hidden these things from the wise and intelligent and have revealed them to infants'” (Matthew 11:25, NASB). “From the mouth of infants and nursing babes You have established strength Because of Your adversaries, To make the enemy and the revengeful cease” (Psalm 8:2, NASB). We just need to cultivate that knowledge and love for Him through reading His Word to them, including them in prayer and worship without forcing it on them, and, most importantly, showing them God’s amazing love by modeling it to them through treating them and others with compassion, mercy, forgiveness, and grace. We don’t need to worry about “training” our children to love Jesus nor fighting for their souls. Rather, we need to worry about accurately portraying God’s loving character to them so that true love for God and others will last a lifetime!